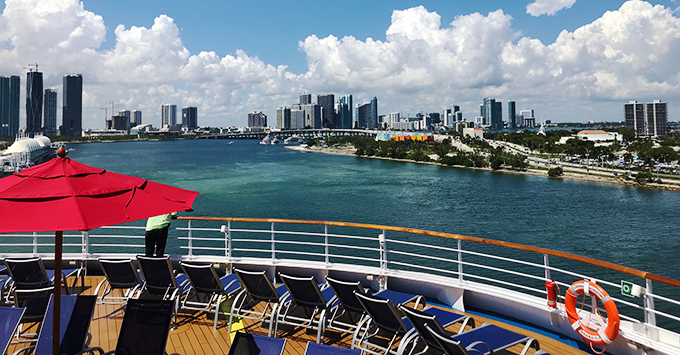 (2:50 p.m. EDT) -- In true "Fun Ship" fashion, Carnival Horizon's first day at its new Miami homeport turned into a celebration featuring the line's Chief Fun Officer, NBA Hall of Famer Shaquille "Shaq" O'Neal, and Miami Heat legends Alonzo Mourning, Shane Battier and Glen Rice. The line's newest cruise ship -- sporting arguably the world's biggest bumper sticker, reading "Choose Fun," on its stern -- arrived in port this morning after spending the summer sailing out of New York; the ship debuted in April 2018 in Europe. Cruise Critic joined Shaq and the Heat as well as Carnival executives, other dignitaries and a small group of journalists and travel agents onboard for an exclusive event to kick off its inaugural two-night cruise out of Miami, from where it will offer year-round six- and eight-night Caribbean cruises. Stealing the show were Shaq and the Miami Heat players, who hosted a musical chairs-style basketball game on the Lido Deck, in which a few special contestants competed for a chance to win a free cruise. 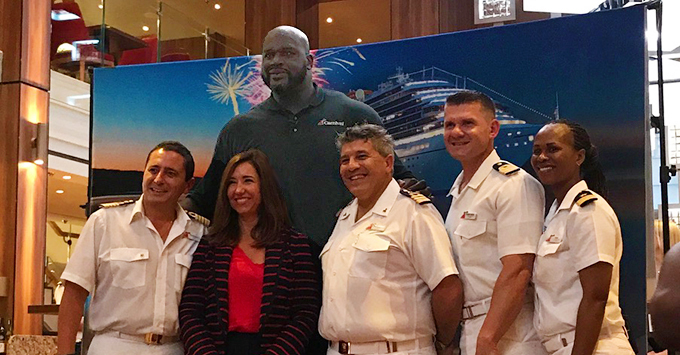 When the game was down to the last player, Shaq revealed all participants would get a free cruise. During the event, Carnival Horizon also received a visit from the Carnival Airship, a blimp raising awareness for the line's variety of new ship deployments. 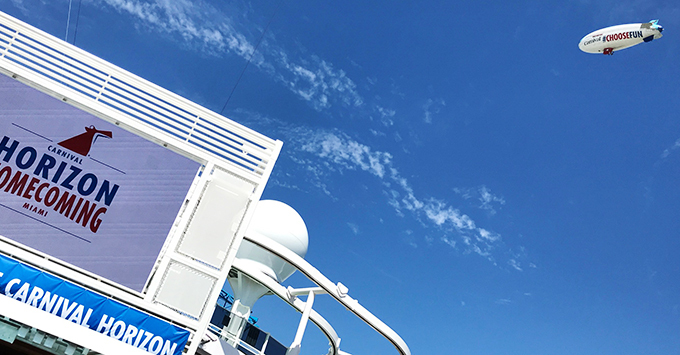 Anyone who spots the blimp on its journey along the Gulf and Atlantic coasts is encouraged to take a photo and upload it to social media with the hashtag #ChooseFun for a chance to win a free cruise and other goodies. The hashtag also triggers donations to St. Jude Children's Research Hospital, a longtime Carnival partner. Carnival presented a $25,000 check with proceeds generated by the hashtag, so far. Funds will continue to be collected as the blimp makes its way from Miami to Orlando, Port Canaveral and Jacksonville, before ending in Atlanta on September 30. "With its awesome top-deck attractions and wide variety al fresco dining experiences, Carnival Horizon is the ideal ship for the Caribbean and this event was a perfect way to celebrate the ship's Miami arrival while benefiting the special children of St. Jude," said Christine Duffy, president of Carnival Cruise Line. "We've always said that Choose Fun is catchy marketing slogan that's worthy of a bumper sticker and now we've put our money where our mouths are by posting it on our newest ship!" The event concluded with a plaque exchange ceremony hosted by the line's chief cruise director and brand ambassador, John Heald, featuring special guests from PortMiami, the U.S. Coast Guard, U.S. Customs and Border Patrol, and Miami Dade Police Department. Passengers also were able to bid farewell to Carnival Vista -- Carnival Horizon's sister ship, which had long been based in Miami -- as it departed for its new homeport of Galveston, Texas. Highlights of Carnival Horizon include Guy's Pig & Anchor Smokehouse and Brewhouse, a casual eatery serving fresh barbeque and beer brewed onboard, developed by celebrity chef and TV personality, Guy Fieri; the line's first teppanyaki restaurant; a Cuban-themed bar and pool area tucked away at the back of the ship; dedicated family cabins with more space and exclusive amenities; a handful of restaurants and bars with outdoor seating; an IMAX theater; and SkyRide "floating" bicycle ride. Carnival Horizon's six-night cruises, departing on Sundays, include stops in Ocho Rios, Jamaica; Grand Cayman; and Cozumel, Mexico. Its eight-night cruises, departing on Saturdays, are available in two different itinerary options. The first visits Grand Turk; La Romana, the Dominican Republic; Curacao; and Aruba, while the second calls at Grand Turk; San Juan, Puerto Rico; St. Kitts; and St. Maarten. Check out Cruise Critic's Instagram for highlights from today's event.